Language(s): English, Russian, German, French, Japanese, Chinese, Korean, Farsi, etc. 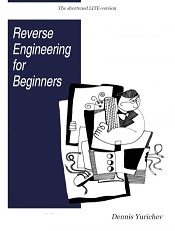 This book offers a primer on reverse-engineering, delving into 'disassembly'-code-level reverse engineering and explaining how to decipher assembly language for those beginners who would like to learn to understand x86 (which accounts for almost all executable software in the world) and ARM code created by C/C++ compilers. It covers x86/x64, ARM/ARM64, MIPS, Java/JVM.